Need dinner in a hurry? 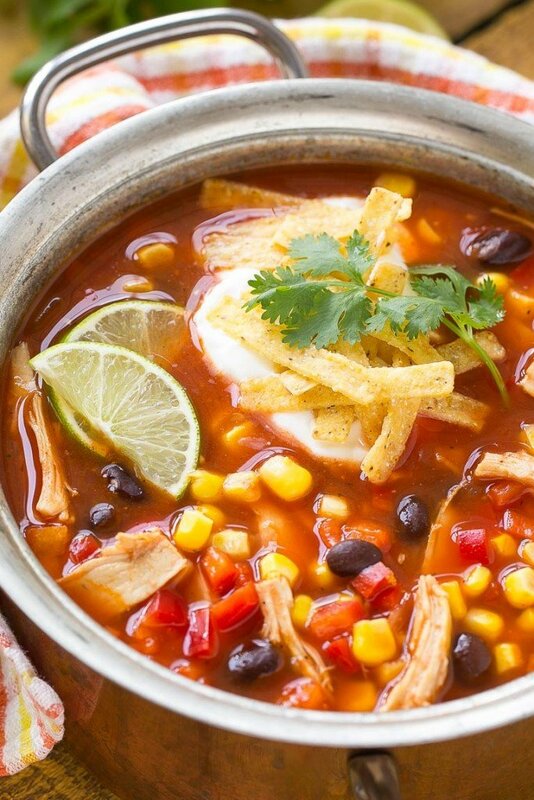 This easy chicken taco soup can be made from start to finish in 25 minutes. It’s full of chicken, vegetables, corn and black beans and is finished off with your favorite taco fixings! 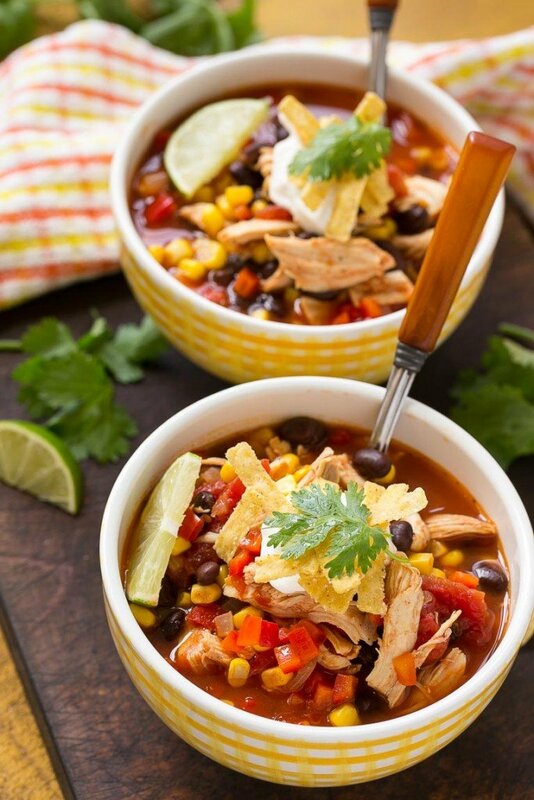 Chicken taco soup is loaded with bold flavors and is so quick to make which makes it perfect for a busy night. You can easily customize it to your family’s tastes! I am a big fan of meal planning, it tends to make dinner time less stressful. That being said, it doesn’t always happen around here. There are plenty of times when I have a plan in place but something comes up – I forget to defrost meat, the kids are sick, the day is busier than planned. Those are the times when I am so happy that I keep a well stocked pantry. It’s not difficult to throw together a simple yet satisfying meal when you have the basics on hand. Some of my pantry basics are brown and white rice, a few types of pasta, nuts, olive oil, chicken broth and canned fruit and vegetables. When I see a sale on pantry items I stock up so that I always have options at dinner time. 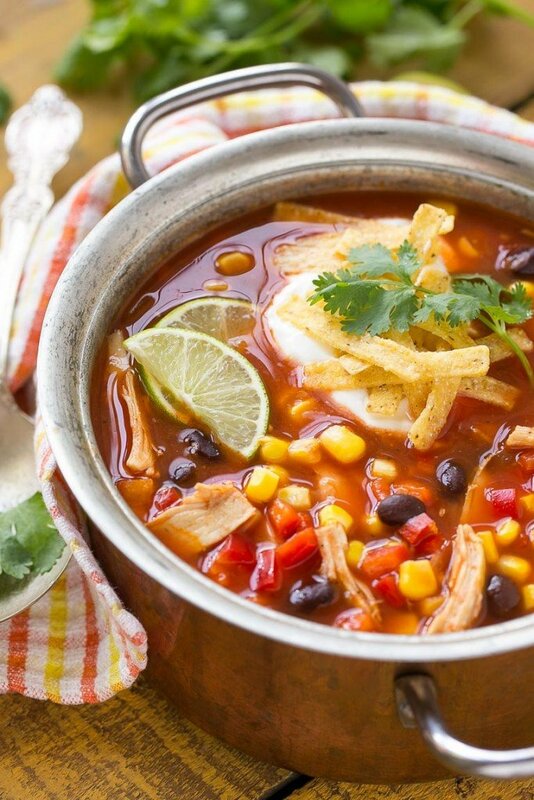 This quick and easy chicken taco soup relies on kitchen staples to get dinner on the table in a flash. This soup starts with pre-cooked chicken – it can be rotisserie chicken, left overs, chicken from the deli counter, whatever works best for you. 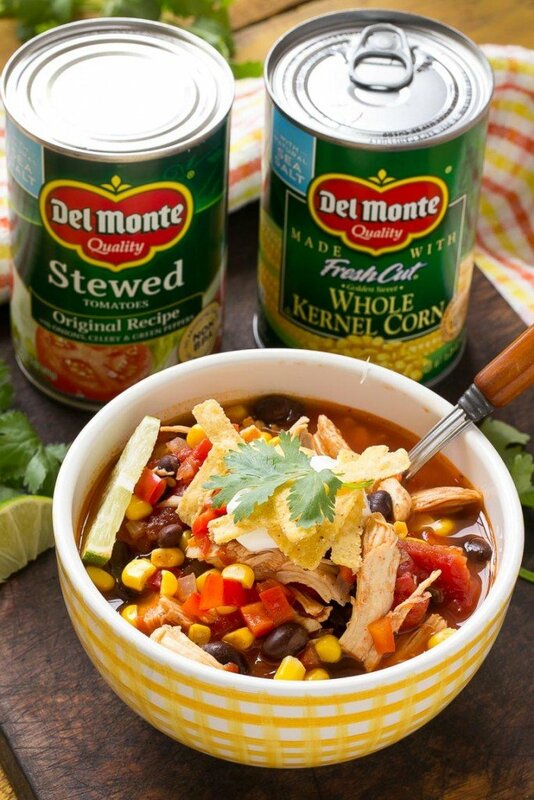 An onion and bell pepper get cooked in a pot and then the chicken goes in along with my helpers from the pantry – a can of Del Monte Stewed Tomatoes, a can of Del Monte Golden Sweet Corn, a can of Del Monte Tomato Sauce and a can of black beans. That’s a lot of cans! I mean that in the best possible way, because it significantly cuts down on prep time. I also like that the stewed tomatoes are cooked with aromatics like celery and onion – it makes this soup taste like it’s been cooking for an hour when really it cooks for just 15 minutes. Once your soup is made, it’s time for the fun part – the taco toppings! You can set out all of your toppings and let the family make their own creations – some of my favorites are shredded cheese, sour cream, tortilla chips and avocado. 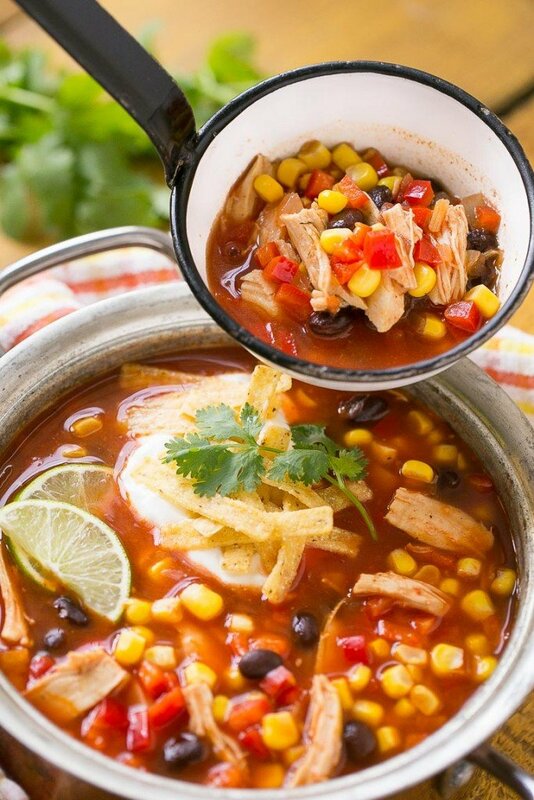 A quick and easy chicken taco soup full of vegetables and beans that is ready in 25 minutes. your choice of taco toppings tortilla chips, sour cream, cheese, avocado, olives, etc. Heat the oil in a large pot over medium. Add the onion and pepper, season with salt and pepper and cook for 5 minutes. Add the black beans, stewed tomatoes, corn, tomato sauce, chicken and taco seasoning. Stir to combine. Add the chicken broth and bring to a simmer. Cook for 15 minutes. Taste and add additional salt and pepper if needed. Serve the soup immediately with your choice of taco toppings. This soup can be frozen for up to 3 months. Fantastic recipe! So easy to get together and taste amazing!! We served fritos and sour cream on top! Thanks for sharing your recipe!!! I made chicken enchiladas yesterday have left over shredded chicken! Gonna make soup today looks delicious!! This is soooo good and sooo easy!! I used boneless cooked and shredded chicken thighs because we tend to like thighs over chicken breasts. Will be making this again! I have a question about the Chicken Taco Soup. Do I cook the first and then ad it to the soup pot with all the other ingredients, ad it raw and let it cook in the soup? I use pre-cooked chicken for this recipe, but if you want to add it raw you could do that when you add the broth and tomatoes and just simmer until cooked through. Love this soup! Easy and oh so yummy! Just made this soup. It is fantastic! Thank you for sharing your recipe. Note: I used hot Mexicam tomato sauce instead of regular because I love spicy food. Glad you enjoyed it, that’s a great idea to use spicy tomato sauce! That soup looks amazing. Great for a cold day! Now this is so my kind of dinner! LOVE! I’ve been wanting to make a soup like this for such a long time and I think I just might after seeing your recipe! It’s starting to cool down over here so it’s perfect soup weather! By the way, your photos are absolutely beautiful! Chicken taco soup is one of my favorites! Can’t wait to try this recipe! It’s so nice to open the cabinets and have some of your favorite canned veggies available to make a fun soup like this taco soup! Perfect for cooler fall nights!! 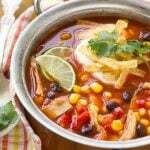 Chicken Tortilla Soup is one of my favorites to make in the winter, it is perfect for game day. Can’t wait to try your version! Looks delicious and it’s definitely the kind of soup our family loves! Can’t wait to try it! This soup looks amazing! I’m always a big fan of quick and easy dinner ideas, so this recipe is definitely a keeper! I recently made this and other than adding a bit more seasoning to fit my tastes it was easy and very flavorful. I will keep this recipe and look forward to trying others.